Sellers spend too much wasted time, energy, and effort worrying about what the competition is doing and how to beat them in the market. My advice – stop worrying about your competition and focus on being the best you can be. How can I best serve my customers? How can I be the best provider for the market? What do my clients say they need and want? You didn’t start your business because you woke up one morning and said, “I’m going into business to be better than this other guy.” You aren’t successful because you say “All I want to do is win versus the other guy.” You are in business and successful because you believe in what you do, you believe your product or service is the best choice for your customers or clients, you believe you have hired the best people, and you know you provide tremendous value in exchange for just compensation. Most of the sales education I have received (some of my training comes from the Big Blue selling machine, IBM) and the seminars I have attended describe the business development process as a triangle between your company, the customer or client, and the competition. 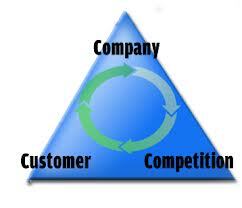 I prefer to use a simpler business development model where all I need to do is focus on the potential customer/client. Business, products, services, markets, selling, marketing, distribution are not getting simpler. Why complicate your development process more than necessary? Jeffery J. Fox in his book, “How to Become a Rainmaker” makes a valid point. When faced with a competitive situation, it’s always best to say “Yes, that is a good company, would you like to know our points of difference?1” Mr. Fox also encourages sellers not to disparage a prospect’s previous buying decision. It’s acceptable to reinforce a previous decision, because now you are going to give your prospect new information so they can make an even better decision. No need to even mention the competitor by name; just move the conversation right to your points of difference. Highlighting someone else’s deficiencies is a sign of weakness or insecurity. When we don’t have the best thing to say about ourselves, our product, or our company we revert to a strategy of deflection; look at what they can’t do, or how terribly they completed that project, or watch out for companies who can’t do whatever. If you find yourself knocking your competition, this should be a red flag to improve whatever it is you don’t want to talk about. If something is important to your client or customer, than it should be important to you. Do you hate to lose? I hope so, because I know I do. To paraphrase Brad Pitt’s character Billy Beane in the movie “Moneyball” and as Jimmy Connors said before that “I hate to lose more than I love to win.” I think losing is one of the best motivators for success. Losing is also one of life’s great educators, if we let it. After a loss, it’s important to understand what you can do better next time and then quickly move on. Competition can be beneficial because it sometimes make us think deeper, try harder, be more creative, and most importantly pay more attention to our clients, customers and prospects. You can’t make the competition worse; you can only make yourself better. So do that. Make yourself better. I would be remiss if I did not use my favorite vacation analogy. When you are on vacation, you want to have the best time you can with your family, friends, and/or significant other, doing whatever makes you happy, re-energized, or relaxed. You are not on vacation focusing you efforts on having a better time than your friends or neighbors had on their vacations. It’s not about who spent the most, was gone the longest, did the cooler activities. A vacation is about relaxation, exploration, education; not about doing something, so you can compare your adventure to your friend’s outing. It’s a fulfillment activity shared between you and a small group. Bring that same approach to your sales process. Buying is a comparative process. Be so good at what you do so your client or customer will be comparing everyone to you. This view of competition may seem counter-intuitive to you; but forget about the competition. Simply focus on what you do best. 1 Jeffrey J. Fox, How to Become a Rainmaker: The Rules for Getting and Keeping Customers and Clients (New York: Hyperion, 2000), 55.